Tomatin Whisky - Metal — NORTH BLOG. Every year when my birthday approaches I get that same question, “What do you want” and I have the same response in jest every time “A bar of Gold” I am yet to get this bar of Gold but today I may be in luck or maybe even be in with a chance of finding some flakes of gold. We headed east for the town of Helmsdale not for fishing which it is known for but in search of gold. There was £1bn worth of gold discovered in this area during a huge gold rush in the 1500s. 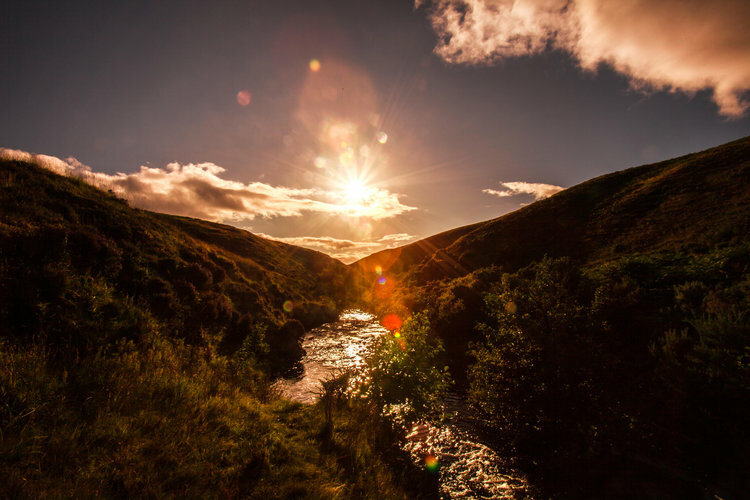 To this day gold has been found and taken from the streams, how interesting it would be if you could go for a wee walk into the Scottish Highlands picking gold as you please. Our challenge today was to visit Helmsdale Museum learning about the town, the history, then get a gold pan and go panning for some gold. We had a chat with the lady in the museum and she recommended a good area for some panning, so we headed about 10 miles up Strath of Kildonan finding a nice spot to park the camper van just next to Beinn Dubhain. Once again we had gotten lucky with the weather with clear skies and not a cloud in sight. 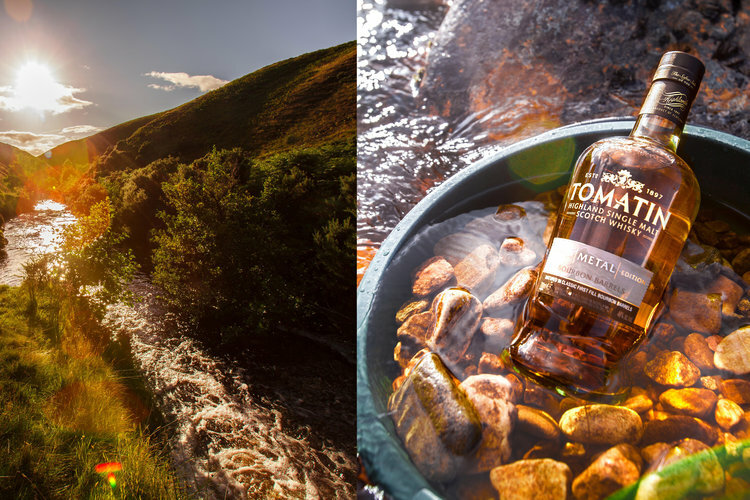 Tomatin METAL whisky was an interesting one, as I was very curious as to how I was going to experience the connection to metal whilst panning for some gold. I didn’t quite know what to expect, but from my previous experiences so far, I was ready for whatever sensations and thoughts came my way. The task of panning for gold is very much a game of patience, it was definitely no gold rush for myself and Jawn, even though Jawn kept saying "I have a good feeling about this." I was liking the optimistic attitude, Jawn was keeping the spirits lifted high. After about an hour of panning we still had no luck, but we did catch all sorts of beautiful stones that consisted of metal fragments. Scottish waters consist of Aluminium, Fluoride, Iron, Magnesium plus the good old trickster Iron Pyrite otherwise known as fool’s gold, which we kept getting in our gold pan getting excited for a split second before realising that the trickster had got us once again. I thought this would be a good time to crack open the bottle of Tomatin Metal Whisky and go for a good sized dram. As I tasted the whisky there was an element to it as if something cold but sharp had hit my mouth with a warm rich sensation, it was like a flash of lightning. It was a strange sensation but satisfying and it built to a peak. Once again after time spent focusing on gold panning, the experience had triggered something in tune with this Metal Whisky that had taken me back to my time spent in Thailand when l had the privilege of visiting a Buddhist temple seeing gold leaf for the first time. When l was in the Buddhist temple l was being blessed by one of the monks who did a prayer of good fortune for me, handing me a drink with gold leaf being the main ingredient which at the time had a raw metallic taste but this time drinking the whisky it was sweet, rich and full of a sharp hint of flavours that wanted to pop but kept its composure. The flavours were interesting, I was blown away by the memory it had triggered. I knew that scents could trigger memories and take you back to a place, but I didn’t realise how much the same might go for tastes in a similar way. I mean if a drink made in Scotland, from Scottish ingredients takes me back to a time and place from another part of the world many years ago this really does tell me how powerful whisky can be, not because of its alcohol content but because it has the strength to take me back to an amazing point in my life of spiritual significance. Things are connected more than we think, and our senses, even taste can transport us back to a positive memory. Tomatin Whisky Metal you truly out did yourself even though you didn't help me catch any gold, but you definitely revealed your secret to me in another way. I struck it lucky there and that was gold in it’s own way. The sun was setting, it was time to find someplace to settle for the night, so we drove to Durness arriving late at Durness Campsite after another long fun filled day.